Warheads Candy Canes: Super sour (and tasty) holiday treats! This holiday season, don’t pucker up just under the mistletoe. 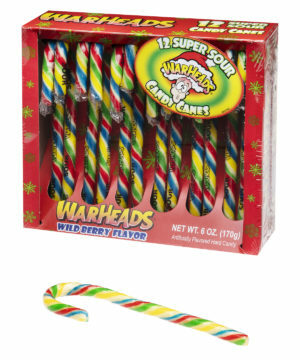 Stuff your stocking and sock your taste buds with sour Warheads Candy Canes. In place of peppermint, these colorful candies feature a heavily tart and sweet taste with a wild berry flavor. Although you might make a face like you just unwrapped a pair of hand-knit ankle warmers, the addictive sour-sweet combination will keep you coming back for more. The intense (but not unbearable) Warheads Candy Canes are a delicious break from the usual seasonal sweets and a welcome sight any time of year. Sweet candy canes with a delicious dill flavor.